I still belong to some Google Groups I joined in preparation for the two 1200km randonnees I rode in the U.S.A. and Canada during summer of 2012. I enjoy seeing what is going on from time to time in these groups, with whom I hope to ride again. Last month, there was a post from a group member asking for help getting in touch with a Seattle-based framebuilder. The member had paid a deposit months earlier ... and had not heard any update or even gotten an email response from the builder in months. He said another customer was in the same predicament. Was the builder sick? bankrupt? Left town on a multi-month bike trip without a smartphone or email? or just unprofessional? Well, the builder's reputation is pretty much burnt toast after several other individuals joined the thread with "I also have not had any word from him in 6 months", each message blast on a grouplist with hundreds of local randonneurs/would be randonneurs. And then even after the builder responded to the group that the situation was complicated and he would explain to each customer off the group list ... a week or two later someone else revived the "where is he" thread. This kind of thing is not unheard of. Framebuilders do not go into the business because they are good at accounting, highly organized, or want to live a regimented existence in a large organization. They are sole proprietors and free spirits. Of course, framebuilding is a business, and customer interaction is the key in sorting out who among those that attain a core level of craftsmanship actually survive and prosper. I am building up a bike for a Japanese friend/colleague. He and I agreed that steel is most appropriate material in this case, so I consulted Hiroshi at C Speed about the best way to go about getting a nice steel frame in a 52-53cm size. Hiroshi suggested Panasonic's order made frame service. The frame is not "custom". But it is "order made" from a wide range of options -- standard geometry, but several different tubesets, and sized to the single cm (in this case a 53cm C-T seat tube, not 52cm nor 54cm). Also there are many options for paint, logo size/placement, and an optional owner/rider name on the top tube. Hiroshi tells me that Panasonic -- which has made great frames for many decades -- has a team of 6 builders on staff. And it is Made in Japan. 国産. Panasonic offers delivery within 1 month of the order. The cost, including frame, fork and threaded headset, is around $1000 (less for heavier steel, a bit more for Tange Prestige or Reynolds 8630; a lot more for titanium). UPDATE: The final bike can be seen here. Panasonic Tange Prestige Cro-Mo steel frame -- with optional paint in Panasonic signature colors. The only downside, from my perspective, is the "Panasonic" logo, which I associate with electronic goods, not bicycles. 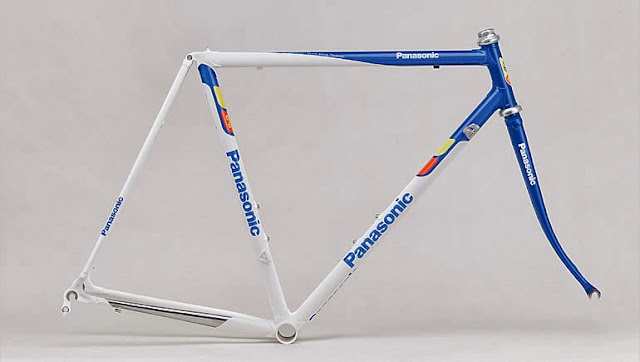 But Japanese remember the Panasonic/National frames of days past and so do not have the same issues with the brand. 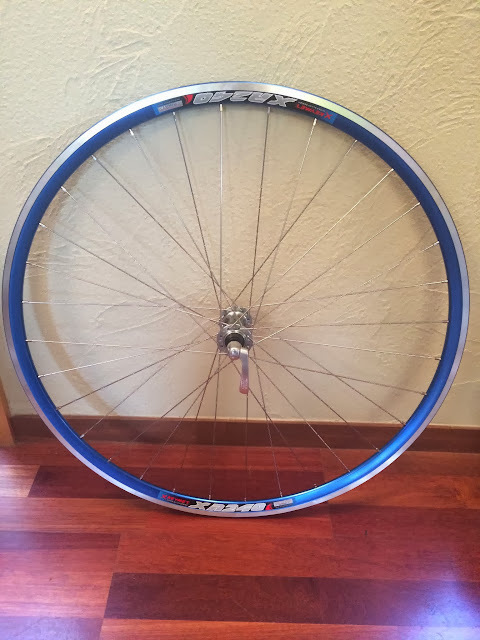 As for the wheels, Hiroshi had sitting in his shop a beautiful (barely) used rear wheel, with Dura Ace 7403/Hyperglide freewheel hub, Hoshi 1.8mm spokes and Mavic Open Pro blue rim. This week, I built up the front wheel (Wheel No. 00015) -- a blue rim to match (Kinlin X Keymet XR240), with a (500 yen closeout sale) Tiagra hub and 3X 32 DT Revolution spokes. Not quite the same level of components as the rear wheel, but the color matches, and I hope my colleague will like road cycling enough so that this is not the last wheel he ever uses. Wheel Set -- now with Panaracer 700x26 tires and Ultegra 6600 12-27 cassette. And Panasonic rim tape. And Panasonic will not likely go incommunicado before delivery (.. despite the parent company losing more money in each the past 3 fiscal years than the entire profits of all bicycle manufacturers since the beginning of history). I look forward to taking delivery of the frame and getting work on the build before the end of the month! Pretty sure now that this is a Shimano Dura Ace RH-7403 rear hub (with hyperglide freeewheel).